I am a fan of Shauna Niequist's honest and approachable style. Her devotional Savor: Living Abundantly Where You Are, As You Are is one I've relied on for the past couple of years. Having read probably 10 books about "slowing down" and "simplifying," I'm never quite sure if I'll glean anything new from a book or if it will just be more of the same. 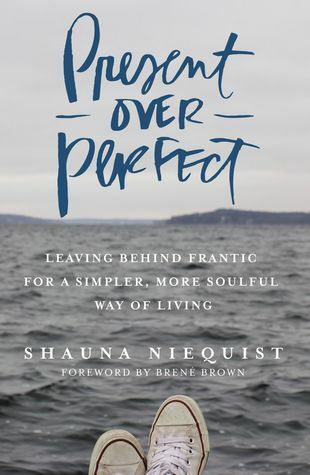 I'm not sure if Niequist's writing just resonates so well with me, if I was desperate to hear the message, or if this book is really that good, but th I am a fan of Shauna Niequist's honest and approachable style. Her devotional Savor: Living Abundantly Where You Are, As You Are is one I've relied on for the past couple of years. Having read probably 10 books about "slowing down" and "simplifying," I'm never quite sure if I'll glean anything new from a book or if it will just be more of the same. I'm not sure if Niequist's writing just resonates so well with me, if I was desperate to hear the message, or if this book is really that good, but this book struck a major chord. The highlighter function on my Kindle was working in overdrive while reading this book as my brain went right along saying "Yes! That's right! This is what I need to do. This is what I need to *stop* doing!" As much as a liked this book, there were a few chapters in the middle that seemed to drop out of the sky. They related to some very specific church-building initiatives and seemed out of place in the book. If you want to start your next year out right, this book is for you. Niequist really explores our lack of presence in our lives as this becomes overshadowed by busy schedules and pleasing the wrong people in our lives. Basically, this book is giving you the side-eye, overcommitted extrovert. You know it is! Shauna shares her own struggles of overcommitting, guilt about what she isn’t doing, and how we look for validation through social media instead of the people sharing our home. Yup, it hit me r If you want to start your next year out right, this book is for you. Niequist really explores our lack of presence in our lives as this becomes overshadowed by busy schedules and pleasing the wrong people in our lives. Basically, this book is giving you the side-eye, overcommitted extrovert. You know it is! Yup, it hit me right in the gut. I really enjoyed the book "Bread and Wine", but I struggled to finish this one. Too repetitive and the new age religious tone of this book, well lets just say I'm not a fan. As someone who can get caught up in the act of perfectionism and the frantic lifestyle, I really took away a lot from the content of this book. If you are sick and tired of feeling sick and tired, this book may be a helpful tool for change. Although the author and I live drastically different lifestyles, I can relate to her struggles as well as the desires she has for her life. This book was a good reminder to refocus on what my priorities are in life and I found her stories profoundly relatable As someone who can get caught up in the act of perfectionism and the frantic lifestyle, I really took away a lot from the content of this book. If you are sick and tired of feeling sick and tired, this book may be a helpful tool for change. Although the author and I live drastically different lifestyles, I can relate to her struggles as well as the desires she has for her life. This book was a good reminder to refocus on what my priorities are in life and I found her stories profoundly relatable. I think it’s too easy to over complicate our basic wants and needs and the importance often lies in the simplistic. A 4.5 for me. A really strong (good) message about not hustling. Almost feels like she can see into my brain. I did not learn anything from this book. The best thing about it was the title. The rest was her complaining about how busy she is and how she isn't going to write books anymore—while she is writing a book. I wish it had more practical advice, or even just wisdom about what matters in life versus what doesn't. Instead it felt like a lot of self-loathing followed by peace followed by more self- loathing. If you're not a person of faith -- like me -- you can easily skim over that stuff and/or fill it in with whatever your spiritual preference is. That said: I don't think she goes there deep enoough. Niequist realized she was filling her life with tasks and to-do lists and that she needed to make things more simple. To say "no" more. And yet, there's no real reflection upon why. "I want to be more present" would be worth really diving into, and yet, it's all superficial. There's nothing new in here If you're not a person of faith -- like me -- you can easily skim over that stuff and/or fill it in with whatever your spiritual preference is. There's nothing new in here for readers who are familiar with the work of, say, Brene Brown. What's missing is the real vulnerability. And not to mention, very little reflection upon privilege and how she COULD just start saying no because she had the safety nets to do so (something any woman of color can't do, let alone any woman who isn't middle class and comfortable). There is a certain peace and freedom found in these pages. Today I decided I would read this book. And I did. All day. It's the only thing I did, really. And I'm glad. I'm in this same season of stripping away, deciding what I can and can't do and learning how to say no. Learning how to say yes. And learning how to jump. And sometimes, well, all the time, God gives us exactly what we need when we need it most. Today it was this book. Shauna Niequist - Shauna Niequist is the author of Cold Tangerines, Bittersweet, and Bread & Wine. Shauna grew up in Barrington, Illinois, and then studied English and French Literature at Westmont College in Santa Barbara. She is married to Aaron Niequist, who is a pianist and songwriter. Aaron is a worship leader at Willow Creek Community Church and is recording a project called A New Liturgy. Aaron & Shauna live outside Chicago with their sons, Henry and Mac. Shauna writes about the beautiful and broken moments of everyday life--friendship, family, faith, food, marriage, love, babies, books, celebration, heartache, and all the other things that shape us, delight us, and reveal to us the heart of God.